We’ve all been customers, and at some point we all have probably needed to pick up the phone and dial into for some extra support, time and time again. But if you have interacted with customer service at all in the past year or so, it should be very clear that there massive shift has already started to develop. Contact centers solutions always been in the forefront of some cool technology, just look at the IVR coming into play in the 80’s, and more recently contact centers have had a laser focus on improving the customer’s experience. We all know an unhappy customer will quickly vote with their wallet, and spend elsewhere. So as more and more companies have kept up with the times and technology, we’ve seen businesses open up their service in new paths of communication. Connecting the physical world, and the digital experience that almost all of us are fully immersed in (between all of our phones, tablets, and computers) is what the omnichannel is all about. As businesses continue to adapt to the new technology trends, we have gained not only these increasingly digital experiences, but better customer service all around thanks to the focus on context, and leveraging the technologies we are already familiar with – like text based support, or even in-app support options. Building off the omnichannel experience already so prevalent, is the addition of the most recent trend: AI and Chatbots in customer service. If you are just now hearing about chat bots and how they will change customer service, you might be a little bit behind the times. Just as adoption of the omnichannel experience quickly grew, so will chatbots. In fact, we are already starting to see chatbots make their way into some very big name applications. But for those unaware, we decided to take a close look at the omnichannel experience, how chatbots are improving customer service, and how your business can utilize these technologies to construct a truly modern customer journey. I’m Lost, What Is Omnichannel? So starting from the beginning, an omnichannel experience is one that connects customers through all methods of communication and interaction, this could be texting, messaging, phone calls, emails, retail stores and apps. An omni-channel experience is a connected customer journey : all methods of contact, all the platforms, and all the tools a customer uses are seamlessly connected. Bridging the gaps between a customer’s different interaction points, such as browsing the website and making a phone call, help improve the journey and experience by supplying customers with the service and answers they need. The omnichannel experience should also remove the unnecessary hoops a customer would have to jump through to receive the support they need. 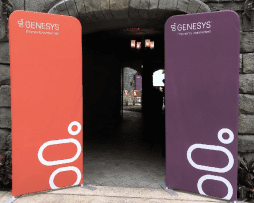 Disney certainly goes to great lengths to provide the best possible experience at their theme parks, and they do so now by including an omnichannel guest experience. When visitors book their trip online, they can use Disney’s website plan out their daily schedules, use the app to access this information in the park, or even discover new attractions. All of this also connects to their Magic Band program, which allows users to load all of their park tickets, fast pass, and even money to purchase food or souvenirs into a piece of hardware – a “magic band” that visitors wear around their wrists. Then again, the app can be used to track everything the band does. Disney has integrated their website, their apps, their park’s rides and a new piece of hardware to create a connected, seamless omnichannel experience. Apple is all about efficiency, and experiences or products that just work. Apple wants to hide all the dirty technical stuff behind the scenes, and present users with a beautiful and seamless experience. Kind of like how they opened up the iPhone dialer to other UC players for a seamless mobile VoIP experience. This even extends to the Apple stores, from the design and layout of the store fronts, to how the entire store operates and assists customers. When visiting an Apple store, you’ll notice employees all armed with iPads or iPhones, allowing employees to check stock and availability, schedule and look up support appointments, or act as a point of s ale anywhere in the store. All the information about customer’s accounts, order history, and service requests are all available directly on the iPad for associates to assist customers without their interaction of logging into a computer or explaining previous visits. All receipts of purchases are also directly emailed to customers for that extra digital edge. While the customer doesn’t interact directly with the digital channels in the store, employees utilize the digital aspect to help provide a seamless experience for customers. So What About AI and the Chatbots it Powers? So these two examples are great and all, but why go further? We’ve seen how a business can use digital technology to improve not only the customer’s experience, but equip their employees with the necessary tools to better assist customers – and provide a better experience, which at the end of the day should improve the company’s bottom line. After all, happy customers are more willing to return or even spend more right then and there, and quicker service or help requests means higher volume that agents or employees are able to handle. So the true question then becomes how exactly do chatbots fit into the mix here? Well as we know, chatbots will help improve customer service by providing simple, quick and context based interactions for customers to receive basic information or help, almost instantly.Chatbots can work as the first line of defense for your customer service, helping to solve the easier problems, say checking order status or availability, so that your agents aren’t bogged down by the super simple stuff. Chat bots would help direct customers to the assistance they need, and escalate to an agent after attempt to solve the issue themselves.But don’t cut chatbots too short, as we will take a look at some examples later on of how chatbots really are replacing humans in certain interactions. In retail and hotels, some service options can be solved without the need for direct human to human interaction. Chatbots are powered by Artificial Intelligence, and can do more than simply interact with customers in place of an agent. In fact, chatbots and AI can be used to help assist your agents directly.First off, bots just like your IVR can help route service requests to the best agents, but can also help your agents by suggesting proper responses, or solutions, to agents. AI can process a database of information much quicker than human mind to find the answer to a problem. Over time the system will only improve and grow its knowledge base.Chatbots will become familiar with common issues and solutions, and it will learn how to trouble shoot more complex ones. So chatbots can also be your agent’s personal assistant, not just your customer’s. Focusing more directly on AI than chatbots, we look towards the concept of Machine Learning. A division of Artificial Intelligence, Machine Learning is essentially a method of data analysis.More specifically, Machine Learning is the idea of using algorithms to provide computers with the ability to learn. Essentially, the computer will look at patterns and information provided and can “learn” to preform specific tasks without being programmed to do so.In the case of customer service, machine learning can be used to analyze your entire system, and the customer’s journey. Machine Learning can help determine problem spots, where customers get stuck, where and when problems develop, and in the end how to improve your customer’s journey to solve these issues. Machine learning will be a powerful tool to help find all of the leaky pipes in the drain system that is your customer service platform, and customer’s journey. On their own, chatbots, AI and digital omnichannel platforms help transform customer service. When brought together, and tightly integrated into the same experience, chatbots powered by AI are the next step to improving the omnichannel experience and customer journey your business provides your users, clients, prospects and customers. In order for your bots to help deliver a seamless, consistent customer experience across physical and digital channels, they should follow a small set of guidelines and provisions. Your chatbots need to work seamlessly throughout all methods of contact so customers know what to expect, and aren’t confused when switching. If a conversation starts in a mobile app, then moves to a website, customers should experience the same platform, same responses, and bot should keep the previous context and conversation from before to keep moving the transaction forward. Bots need to be able to keep up with the vast information that will be constantly piling into them. Powerful machine learning, as noted previously, can help improve not only the customer’s experience, but your entire customer service and omnichannel platform through analysis and optimization – but it needs to be quick to stay on top of the most recent trends, changes, issues, and information. Access to both real time customer information, as well as existing content from your website such as FAQs, or tutorials. 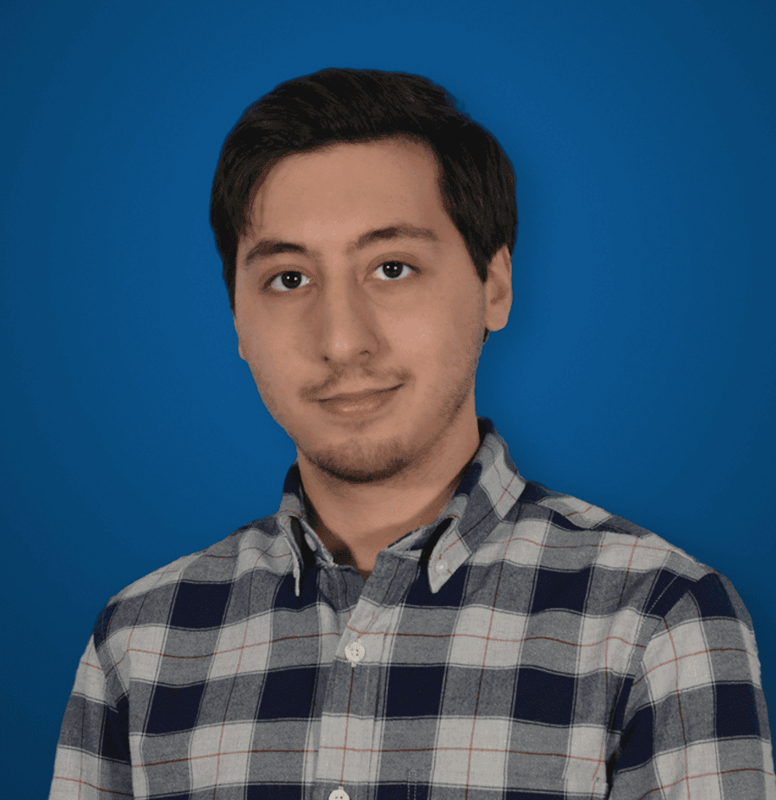 Bots that can access these pools of information can improve the experience with context and instant trouble shooting responses, saving the customer time of having to re-explain their issue, or weed through tutorials themselves. Engage in personal conversations to provide users with an engaging and human like interaction. Simply greeting users by name, and responding with a bit of emotion in responses can help turn bots from life-less interactions into cheery support with polite and helpful responses. A personalized conversation can also better help serve the individual’s needs or solve an issue better with relevant context. Each interaction should be personal, not generic. So How Does It Look In The Real World? How your business looks to implement AI into your omnichannel experience will really boil down to creativity – what exactly is available to your customers, how can it be improved, and at what level can you include AI and chatbots? You might be saying right away that your industry simply doesn’t have room for chatbots, but don’t rule anything out right away. To give you a starting point, here are some examples of how AI and Chatbots are empowering a seamless, digital experience right now. Right off the bat Amazon’s Alexa is one of the most glaring examples, even more so than other personal assistants we’ve grown to love like Apple’s Siri or Microsoft’s Cortana. Amazon’s Alexa is unique in that this assistant interacts with Amazon’s database of information and content, as well as your own information like purchase history. Users can use Alexa for simple commands to look up the weather, or play music with a specific artist name, or just a generic “play 80’s music” command. Users can also directly order items with Alexa, and will soon be able to order food or other services. Amazon’s Alexa uses AI, and what is essentially a voice operated bot, to help users access Amazon’s database of products, music, movies, and related services. 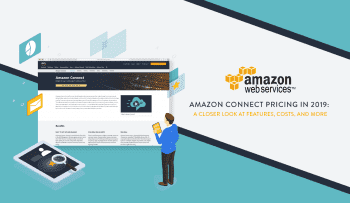 The experience is seamless in that it requires only a simple conversation voice interaction, but also immediately relates to your Amazon account, with activity visible when you log in online. The beauty is in the name of the technology, conversational AI. Its so easy, because Alexa responds as if you are holding a conversation with a real person. Just like my favorite example from Vonage’s CEO, we have an airline taking advantage of the digital experience and AI. KLM is already no stranger to modern customer service, employing a small army of 235 social media experts to handle the massive deluge of 10,000 plus daily comments, in different languages. However, KLM is also looking for ways to integrate AI with their human counterparts. 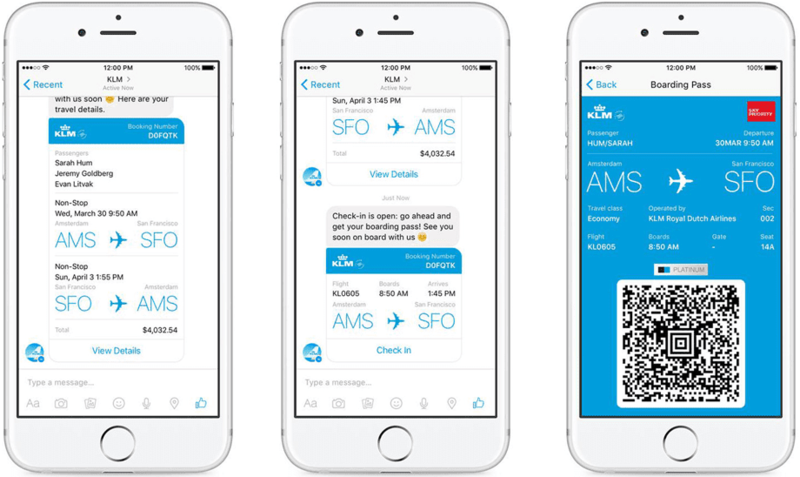 Well back in March of 2016, KLM added in a Facebook Messenger chatbot to their army, to help fliers access some of the more basic information without having to deal with an agent, or an annoying website login process. Users can gain simple information like automated updates around flight times and delays, and can even receive a copy of their boarding pass directly from the chatbot. If there’s a more complex issue, a KLM agent will jump into the exact same conversation the user is already taking place in. But on top of that, KLM even uses Machine Learning to empower its agents like I had previously explained, providing advice through a database of 600,000 KLM specific questions and answers. And this will only grow as the chatbot is used more, and more over time. One of the more recent deployments, one that won’t hit all locations until Summer 2017, and a great example of combining AI, voice controls and customer service. 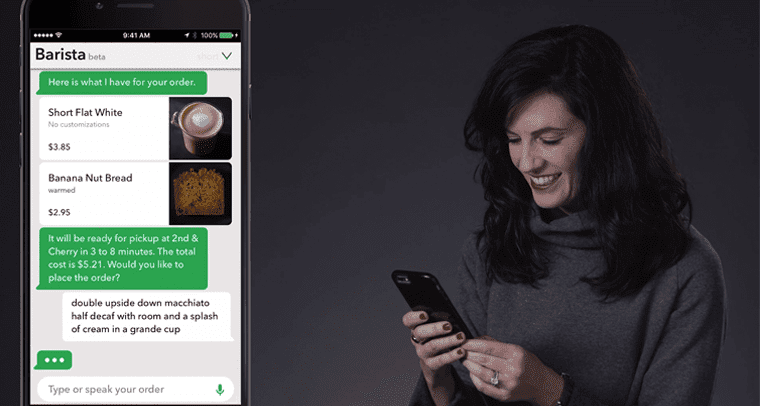 Starbucks has launched their My Starbucks Barista app, that simply allows customers to order and pay for their food or coffee directly through the app, just by speaking out loud. Users have more in depth control as well, like the ability to modify their order. The entire process is trying to replicate the natural interaction of ordering with a barista in a physical location. Of course, AI is used to process all the incoming information with a messaging interface for users to interact with their virtual Barista – who only responds in text messages like a standard chatbot. The app then helps find your closest location for you to pick up your order. One top of it all, Starbucks even created an Amazon Alexa plug-in for users to re-order their favorite drinks with a simple “Alexa, order my Starbucks” command. This stuff really isn’t just science fiction anymore, only conjured up in movies and books. While we may not have holographic assistants or life like robots attending to our every need quite yet, AI and Machine learning are only just learning to crawl, let alone walk. Contact centers and customer support are unique in that they can leverage a massive amount of the newest technology to provide an all around better experience for both the agents and employees, as well as the customers. Combining the physical and digital world, connecting our cell phones to our menus or boarding pass to our messengers helps leverage the technology customers are already utilizing – which means a higher chance of adoption. No one likes calling support, but everyone texts and improving the customer’s experience will simply improve your bottom line.